If gardens could talk, oh, the stories they might tell. At my house, the tale would begin twenty years ago, when bulldozers came to clear an opening in the woods suitable for growing food. Seasons passed and the garden grew and prospered, but then personnel changes caused the plot to go through a fallow period. The space left to rest was quickly invaded by a legion of invasive plants, from privet to poison ivy, plus plenty of tree seedlings from the adjoining forest. It doesn't take long for tamed space to go wild, especially in enriched garden soil. First come giant weeds and grasses, and then brambles and tree seedlings sneak in accompanied by invasive berry-bearing shrubs that are spread about by birds – multiflora rose, privet, autumn olive, and maybe some Japanese honeysuckle in the US, or rogue cotoneasters or rhododendrons in the UK. Many property management guides will tell you to use herbicides to restore order to a neglected garden, but I don't think chemicals offer a sound solution. Besides, you can't get rid of established perennial and woody plants in one fell swoop. In my experience, it takes two to three years to clear overgrown space of unwanted plants and restore its ability to grow good vegetables. When clearing overgrown land by hand, the first things to go should be the woody trees and shrubs, which can be dug, hacked or pulled out if the trunks are less than 2 inches (5 cm) in diameter. First use a very sharp spade to dig around the plant and get an idea of its root structure. Then use a sharp hatchet to sever exposed roots. If the plant cannot be pulled by hand at this point, you can dig some more or use a Brush Grubber or similar device to pull the plants with the help of a vehicle or lawn tractor. Whatever you do, do not cut off the woodies a few inches above the ground, where they will be a hazard to humans and lawn mower blades. If you can't pull out an established tree or shrub, saw off the stub as close to the ground as possible. Then use a drill to make several holes in the stump, and fill them with salt. The salt will help kill the stump, eliminating competition problems from roots that remain in the soil. I once visited a man who had cleared a huge yard of woody plants by hand, and he showed me the spade he had used for most of the work. Between constant sharpening and wear from digging, what was once a standard garden spade looked like a child's shovel. As he said, it's great work if you can get it. Brambles and vines are reasonably easy to dig out if unpleasant to handle, though you should expect to see them try to make a comeback from bits of root left behind in the soil. But the most persistent plants are usually tap-rooted perennial weeds such as docks, burdocks and thistles. Effectively managing established perennial weeds may take two or three years, because in addition to removing living plant parts, you must watch for new seedlings, which tend to be numerous for a couple of seasons. Once unwanted plants are removed, the next step is to plant a vigorous yet easy-to-control cover crop in the reclaimed space, so it quickly forms a thick cover of vegetation. For example, you might use phacelia in spring, buckwheat in summer, or mustard in fall. As soon as the first cover crop starts to thin, take it down and plant another one. As you work, prepare to be humbled by the number of weeds and thug plants that have come back to life. After three diggings and two cover crops, the soil can be shaped into permanent beds for long-term improvement, and you can grow undemanding crops like lettuce or dwarf beans. The overgrown garden is officially restored. The best thing to do with woody debris is to chip it, and renting a chipper may be worthwhile if you have a lot of slender saplings on your hands. Wood chips are my favourite material for paving around the composter and other mud-prone areas, and they are great for mulching blueberries and other plants that like acidic soil. As for prickly brambles, I usually resort to partially burning them using a method that turns them into charcoal, or what some people might call biochar or agricultural charcoal. First I enlarge a hole already made from digging out say, a blackberry/burdock duo, and then pile some accumulated debris in the hole and set it on fire (under legally permissible conditions, or course). 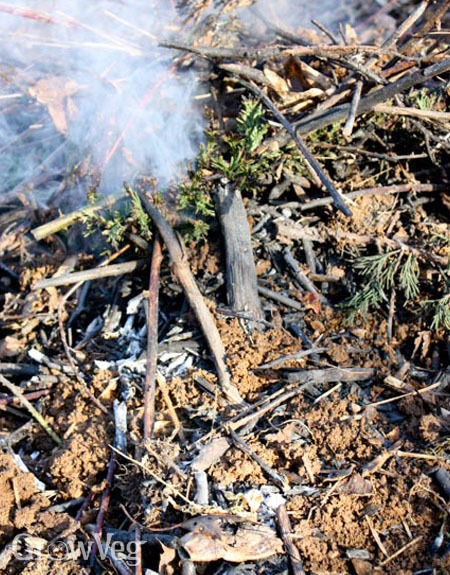 Then more debris goes on, and just when the fire really gets going I snuff it with soil, leaving the material to smoulder. The fast fire leaves the half-burned bits and pieces riddled with holes, which makes them wonderful habitats for soil biota that work best with shelter, oxygen, and carbon together in one place. It's the best way I've found to turn thorny old blackberry canes into something good for my garden. "In Organic Gardening I came across Zonix from www.NOPsupply.com It is suppose to prevent Black Rot. I have been told that is what I have on my Stanley Plun and two peach trees.Do you know anything about if it works and how would I get it on the trees? Zonix is suppose to be Organic Biofungicde." "It looks to me like Zonix might be a good alternative to copper sprays for tomato late blight and certain downy mildews that produce zoospores. You can visit the manufacturer’s site at proptera.com for detailed information. It is labeled for use on plums, but will not control brown rot, which does not produce zoospores…Stanley plums ripen late, so they are at high risk for brown rot. Because of high disease pressure in my area, many people have given up on organic peaches and plums and grow apples, pears and Asian pears instead, along with many berries. Good luck!" "I'm strongly against using chemicals in the garden. It doesn't matter if it's too overgrown or if it needs stimulation to grow. Commercial herbicides contain far too danegrous chemicals and can cause more harm than do good. Your article is really useful. I bought a new house in march with a big garden but it was too bushy and looked like a miny jungle. I tried following the steps in your post and everything came out perfect. I was aware of some of the things but didn't know about the part with the planting of "igorous yet easy-to-control cover crop in the reclaimed space". Never thought of that. I planted some wild-life friendly plants so I can attract bees and other wild critters that can do good to my property. I plan to go all organic and natural and never use a single chemical on my plants. I'm almost 100% sure that you don't rely on chemicals too. There is this useful article about the ugly truth about lawn care products that you might find interesting to read: http://www.ipernity.com/blog/1605118/969022"
"This is a great article. Where you say "As soon as the first cover crop starts to thin, take it down and plant another one.". What exactly do you mean by take down? Do you pull it out or turn it all into the soil? Thanks." "As long as you use annual cover crop plants like buckwheat and mustard, you can easily chop them in or pull them out, and the same goes for winter grains. The main thing is to keep the soil busy and working." "i have weed with very viny and lots elasticity roots...in the mix of my flower bed....the problem seems the more you pull them the more they come..any suggestions what to do put on them the natural way w/o damaging all my other plants"
"The best things for weeds are cardboard, newspaper and mulch or unseeded hay or straw on top. I put this in my walk ways, Hills are great too for less weeds.. Wow Ive got to get busy soon. LOL"